Experience China’s oldest city in Xian’s newest enclave! 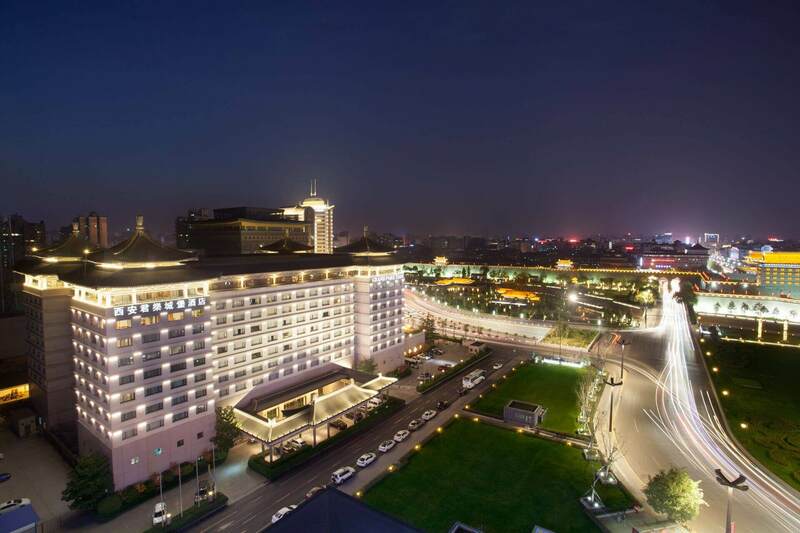 Overlooking the majestic City Wall, Grand Park Xian is a one of the distinguished Xian Five Star Hotels in the heart of this beautiful city in China. Boasting an imposing façade with tiled roofs that evoke the grandeur of an ancient palace, the hotel is an iconic landmark within the newly launched Celebration Square making it one of the finest and ideally located hotels Xian could offer. Located at Huan Cheng South Road, the 10-storey hotel offers 298 luxury rooms & suites and is within walking distance of main tourist attractions, restaurants and parks. Travel to Xian and delight in our deluxe amenities, designed to pamper whether you’re here for work or leisure. With an ideal location facing the South Gate of the ancient City Wall, guests at our hotel in Xian can look forward to grand views of one of the most time-honoured and majestic parts of the long-standing City Wall. Dining and entertainment options include the elegant all day dining Veranda Café, authentic Cantonese restaurant Park Palace and spacious atrium Lobby Lounge. For enhanced wellbeing, the newly renovated Crystal Club Lounge offers a sports and recreation centre, games room and a tea house. For lavish banquets or intimate cocktail functions, the hotel’s ballroom and seven meeting spaces, together with its dedicated meeting specialists will ensure an event like no other Xian hotels. Just five minutes by foot from Grand Park Xian is the South Gate (Yongning Gate) of Xi’an’s City Wall, the most time-honoured and magnificent one among all the city gates. Stroll along the brick-encrusted ancient fortification and admire the panoramic scenery of the city. At night, take a leisurely stroll along the illuminated city wall and enjoy Xi’an from a different vantage point.For a full cultural immersion, see how the city’s rich history is brought to life in the extravagant song and dance musical “Zui Chang An”. Those looking for some retail therapy will not be disappointed with the multitude of choices ranging from high end mega malls to long avenues lined with souvenir stalls and shops. These are all within the city centre and merely a leisurely 15 minutes’ stroll from this luxury hotel in Xian. Bargain your way through as you go through the plethora of Xi’an souvenirs that include mini replicas of terracotta warriors, wood-carved Buddha, dragon figurines, Tang Dynasty Tri-coloured glazed pottery, handmade paper cuts (one of the most important arts form in Xi’an) and other kinds of folk art. A tour to Xi’an, however isn’t just about going back in time. Come nightfall, you will find streets and buildings bathed in vibrant lights, a reminder that this is a city moving with the times. In particular, the 1000-year Big Wild Goose Pagoda, just 15 minutes away from the hotel provides a spectacularly-lit backdrop to Asia’s biggest musical fountain show that takes place nightly at the huge square. Join in the excitement as locals and visitors dart through the dancing laser lights and water sprays.